Lambrusco di Castellazzo, Ancellotta 2010 and Rosa di Castellazzo. 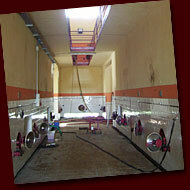 The Vitivinicola Rota produces more than 10,000 quintals of red grape year that are all processed in the cellar. Only a small part of grapes is dedicated to bottling, most of the product is processed and sold in the form of filtered sweet, dumb musts and wines delivered in bulk tankers throughout the country. Only the best grapes are vintaged and bottled here. Fermentation	is one of the most delicate phases of production: thanks to the refrigeration	system we allow it to happen slowly at a controlled temperature of 20 ° Celsius. 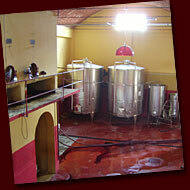 The wine does not undergoe accelerated fermentation and is not ready before the spring following the vintage. During the winter it is left in the natural chill for its slow stabilization, the only way to avoid having to use industrial chemicals. None of our wines requires an artificial enrichment with concentrated grape must, thanks to the amount of sugars naturally present in the grapes due to the low production per unit of the vines.